Noah Lennox aka Panda Bear is, with David Portner aka Avey Tare, a founding member of Animal Collective which can be set among the most important bands of the last decade, important in their inventiveness and adventurous take on folk, electronic and pop music, important in the very fact that Animal Collective is making music history, the kind of band which influence will still spread for many years to come, just like The Velvet Underground, Syd Barrett, Can, Joy Division, Pixies or Slint to name a few did and still does. Over the years, Panda Bear, being first and mostly Animal Collective's drummer, has shown himself as the most productive member so far with already four solo albums, among them the third and masterpiece "Person Pitch" issued in 2007. His first eponymous solo album dates from 1998 and is considered as the very first Animal Collective related album. With excellent albums like "Young Prayer" and the already mentioned "Person Pitch", Panda Bear also appeared as the main brain behind Animal Collective's process, a presumption made even clearer when "Merriweather Post Pavilion" was released in 2009. Indeed this eighth Collective's studio album showed another creative turn in their career and got Panda Pear's fingerprints all over the place, but channeled through the other member's huge imagination and creativeness to make it one of the best albums of their already very high-standard discography. "Person Pitch" hasn't influenced Animal Collective only, for the last four years that album has been the reference point for this new so-called "chillwave" musical trend with bands like Neon Indian, Washed Out and even Toro Y Moi, among others, whose common denominator is characterized by their heavy use of effects processing, synthesizers, looping, sampling, and heavily filtered vocals with simple melodic lines. What separates "Person Pitch" from the others lies first in the melodic lines, which are everything but simple, even if they are very memorable, second in the grandiose stature of the songs and sound production, "Person Pitch" is a cathedral where most of releases by chillwave artists are at best some church in the suburbs. This introduction to make everyone understand that the expectations for this new Panda Bear's album were pretty huge, to say the least. Similar to the previous album, several singles were released prior to the official issue of "Tomboy". July 2010 saw the release of the title track followed every two to three months by the next one, in order of appearances the album opener, then "You Can Count on Me", "Last Night at The Jetty" and "Surfers Hymn". I can already state that I was each time pretty underwhelmed by these singles, if the melodies were interesting and slightly hummable, they all sounded to me like demos. Some of these songs leaked with slightly different mix which made me think and hope for some better recorded and mixed versions on the album. I was also hoping they will gain in substance when listened to as part of the whole album. I can again already confess that this is not the case. 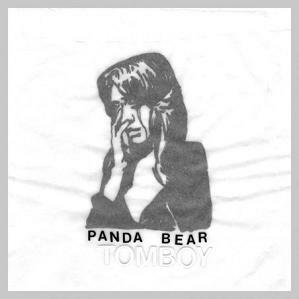 Almost every song on "Tomboy" is using a similar sound process which, even if it gives the album much coherence, is bordering on monotony. Everything, from the beats, the synths, the guitars and even Panda Bear's vocals is using heavy reverberation which makes all sounds bounce all over the place like being stuck in a gigantic ice-cold metallic warehouse where multiple magic balls where thrown in every directions to rebound indefinitely against every walls, the floor, the ceiling and your own totally spooked skull : headache follows irremediably. I played this album numerous time, just because I had it hard to make up my mind about it, I mean, there are too many albums which doesn't seduce me during the first two or three turns but grow after each listen afterwards, and Panda Bear being Panda Bear, I was expecting this would happened again. On the contrary, each further listen raised some upsetting feelings to the point of mere annoyment. I believe the annoyment find its source is the fact that everything in this album is at the same time upfront, washy and disembodied, there's no nuance, no depth, no substance. Panda Bear's vocals are so filtered and repetitive that they sound like a Japanese robot suffering from Alzheimer. It seems that the main responsible for this wishy-washy production is Sonic Boom (sic), ex-Spacemen 3. Well, Panda Bear asked him just for that, we can presume, this is definitely an artistic choice. But sound is not all, even if it has its influence on the way I received each song, I can not find much to save on a melodic, songwriting and rhythmic level. Panda Bear is still very much influenced by The Beach Boys and their harmony vocals, which is very respectable and it worked wonderfully on Animal Collective "Merriweather Post Pavilion" and on his own "Person Pitch", but to me, and this is just my opinion, it feels like Brian Wilson's genius has been left out, just like Panda Bear seems to have left... Panda Bear. This album is incredibly uninspired from start to finish with at least one and a half track to safe near the end of the album. First the very sober, melancholic and clear sounding "Scheherazade", this song really comes as a relief after all these greyish soulless buzzing around with it's very lightly processed piano, some captivating low electronic groan appearing and disappearing under the surface, and even Panda Bear's voice, far less filtered, which as a consequence suddenly sounds so alive and present it fills the whole room. Second track to safe, at least half of it, is "Afterburner" for it's fine and original slightly polyrhythmic patterns, marching, and processed, guitar and synth and the good melody line until it turns repetitive and monotonous for the last third of it. For me, "Tomboy" is a good example that being original doesn't immediately make good music, because that album is indeed original, and Panda Bear, just like on "Person Pitch", tried to "make 'difficult' music scan as almost radio-friendly, to translate experimental moves to a broad audience with little interest in such things. ", to quote Jess Harvell from his "Tomboy" album review in Pitchfork, only this time, it is a failure in my personal and anyway subjective book. Unspooked.